1. To be plentiful or to exist in large quantities. 2. To be present in or to contain something in large numbers or amounts. 3. To be rich or well supplied: The area where David lives is abounding in trees. 1. A more than plentiful quantity of something: An abundance of wealth is a great amount of cash. 2. Lifestyles with more than adequate material provisions: Barry's family has abundances of different homes around the world as well as all of the luxuries that can be obtained for them. 3. A fullness of spirit that overflows: The sermon by the preacher was filled with an abundance of goodwill and kindness. 4. The extent to which an element is present in the earth or in a rock: There is a rumor of an abundance of minerals hidden in the abandoned mine. 5. The proportion of one isotope of an element, expressed by number of atoms, to the total quantity of the element: Mr. Young, the chemistry teacher, urged his classes to study and to understand the abundance factors of the chemical elements. 6. Etymology: nothing suggests great abundance more vividly than overflowing waves; and that is the literal meaning of the word abundance. 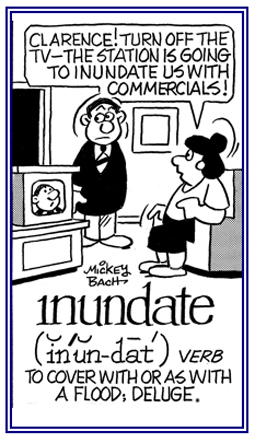 In Latin, unda means "wave", poetically "sea". The Romans combined ab, "from", and unda into the word abundare, "to overflow"; literally, "to come from the waves" or "from the sea"; applied to anything very plentiful. 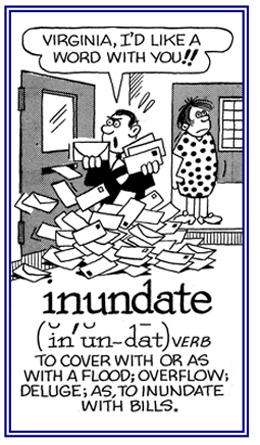 The stem of abundare resulted in the English verb "to abound", and a derivative provided the noun abundance. 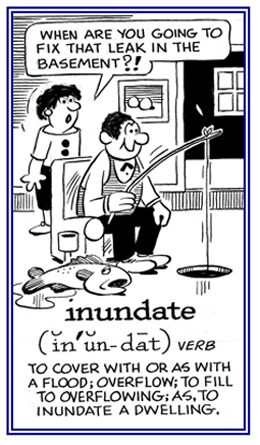 Inundate, "to flood", also comes from unda, as does undulate, "to move like the waves". Translation: "Abundant caution does not harm." Also translated as, "You can't be too careful." To over flow or to cover up. An overflow or an overflowing amount. 2. Overwhelming with force, numbers, etc. 1. To overwhelm someone with a huge quantity of things that must be dealt with: The newspaper was being inundated with letters of protest about the articles being published criticizing the mayor of the city. 2. To fill, to flood, or to cover completely, usually with water: The heavy and long-lasting rain inundated Mark’s basement so much that it had to be pumped out! © ALL rights are reserved. 1. A condition in which water temporarily or permanently covers a land surface. 2. An accumulation of an overwhelming amount of things that someone must deal with. 1. Anything that fills, or covers, something completely, usually with water. 2. That which fills a container quickly beyond capacity; as with a liquid. Relating to a flood or an excessive amount of water. 1. An instrument for graphically recording oscillatory variations, as in alternating currents. 2. Etymology: from French onde, "wave"; which came from Latin unda + -graph, "write, record". 1. To have a particular consequence, usually something good or positive: Shirley made a decision that redounded to a better future for her. 2. To return to affect someone as a repercussion or a consequence; to have a good, or bad, effect or result. 3. Etymology: "to overflow," from Old French redonder, "overflow, abound" (12th century); from Latin redundare, "to overflow". The meaning of "to flow" or "to go back" (to a place or person) is from 1382. Inter-related cross references, directly or indirectly, involving word units meaning "more, plentiful, fullness, excessive, over flowing": copi-; exuber-; hyper-; multi-; opulen-; ple-; pleio-; plethor-; poly-; super-; total-; ultra-. Showing page 1 out of 3 pages of 31 main-word entries or main-word-entry groups.